After launching on Early Access back in November, cel-shaded FPS Wrack is finally nearing a final release. The game has been in the works for over six years at indie developer Final Boss Entertainment and is inspired by Mega Man and Contra just as much as traditional genre games like Doom. With a release date set for September 30th, I had the chance to spend some time with a close to final build and check out what Wrack will have to offer when it’s ready to leave beta status. Content has been added to the Early Access release in stages, but as of right now players have access to all of the modes that will be available once the final product launches. 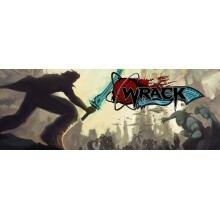 Wrack provides a single-player campaign, time attack, score attack, and a level editor. For the purpose of this preview I played through the single-player campaign on one of the easier difficulties (there are quite a few difficulty levels ranging from super easy to insane) and the time and score attack modes, but have not had the chance to mess around with the level editor yet or play any of the user created levels. I started off playing the last build that was released to the public in June, but after playing a few levels was given access to a closer to final release which added some new tweaks. The single-player campaign is likely where most players will start, as it gives them the chance to acquaint themselves with all of the maps, guns, and enemies while getting a little bit of story to go with it. Wrack is set in a futuristic Earth where all war has been eliminated due to a device called the Hyperion Generator, which can generate matter out of pure energy and solve all of humanity’s major problems. But this peaceful setting wouldn’t make for a very interesting shooter, so it doesn’t take long before aliens decide they want to invade and steal the Hyperion Generator. Players control Kain Sager as he tries to save the day and kill everything in sight. The story is told through comic book style text scenes that are text only, and in this Early Access phase not all of the assets were ready so some scenes had white placeholder backgrounds up. Story generally isn’t the most important aspect of a shooter but I did like how there was a tongue in cheek aspect to many of the scenes as the characters don’t take themselves seriously all the time. This is also reflected in the loading screens, where the developer’s like to throw in silly hints for other video games. One of the first things players will notice is that Wrack moves at a fast pace and is very fun to play right from the beginning. If you’ve been playing Doom again recently or any of the other retro style FPS’ that have hit Steam, the movement and pace should feel familiar, but if you’ve only been playing more modern games in the genre recently it may take some re-adjustment. You start off with an energy sword that functions as the melee weapon, and quickly gain access to a pistol and shotgun. Later in the game more weapons are granted, including a pulse rifle and bazooka. The weapons are all satisfying to shoot and it’s clear that Final Boss Entertainment has spent plenty of time tweaking each one to make them feel just right. Navigating the environments also requires some first person jumping and quick movement to avoid instant death obstacles, and while recent titles like Rise of the Triad reminded me how much I can hate first person jumping I thought it was handled fairly in Wrack. Levels are open and expansive, often providing several different sections to go through before you fight a boss. The level design isn’t quite as non-linear as some of the older FPS’ but there are quite a few secrets to find, and I can’t complain considering how easy it was to get lost in some of those older titles. There are two elements that make the game a bit different from the standard Doom template, and that’s the emphasis on combos and the lives system. As you kill more enemies, a combo meter builds up, and if you chain together enough of them in a row you can do a Chain Finisher that can wipe out all the remaining enemies on-screen. You’ll have plenty of opportunities to do this, as Wrack likes to throw lots of enemies at you in every level, sometimes filling the screen with them. Enemy types range from smaller mechanical spiders to huge robots that can damage you by pounding the ground. One thing that’s important to point out is that the Chain Finisher control doesn’t seem to be bound by default, so I didn’t figure out how to properly utilize the combo system until close to the end of the campaign. Wrack also incorporates lives, similar to Mega Man and Contra. When you die you can instantly press F to respawn, but you will either start at the beginning of the level or the last checkpoint reached. This seems fair as the checkpoints are well spaced out, though you can also quick save at any time so sometimes it did feel like this negated the purpose of having lives. Final Boss has said they are figuring out the best way to tweak the ability to quick save so that lives don’t seem less throwaway, and I’m interested to see how they manage it in the final release. In a similar nod to both of the aforementioned games, the boss battles in each level has attacks that are pattern based and players must figure out how the patterns work to defeat them. On the easier difficulties I noticed that the game tended to give you the answer to the patterns right in the middle of the action, and I’m hoping it is either disabled or can be turned off on the harder difficulties as it doesn’t make sense to give all of that information away. The game looks great and runs smoothly, and compared to most beta’s Wrack is a lot more stable. Although there is one enemy type that is still missing its full animations, the majority of them animate smoothly and I never encountered any framerate drops. I did have one instance in the Recycling Plant where I fell through the world and had to reload, but was unable to replicate this on subsequent play-throughs and think I must have just encountered a random crash. As you can probably tell, everything is cel-shaded and this gives the game a very distinctive look. The use of color works really well and gives Wrack a much different feel from the drab sci-fi shooters that have flooded the market over the past decade. I’ve also noticed that some of the animations and color filters used when you get power-ups has changed from one build to the next, so it seems like the team is still trying to get the right balance down. Sound design is important in an FPS as it allows you to figure out where enemies are coming from. Wrack handles this nicely, as each enemy has a different sound effect and when you hear the ticking of a kamikaze spider it’s easy to figure out where they’re coming from. Given that this is a sci-fi shooter the sound effects and background music fit the theme, and there are a number of music tracks that got me pumped up for the enemy onslaught that I was about to encounter. There were a few sections where the audio levels got weird and the music suddenly seemed to get much louder unexpectedly. I’m not sure if this was caused by something in-game or by my specific hardware setup though, and will see if it still happens once the final build is available. I’ll go more in-depth into some of the mechanics along with the Score Attack, Time Attack, and Level Editor once the final build is out around the end of this month. But based on the time I’ve spent with Wrack so far, it’s really fun to play and strikes a great balance between the old-school Doom gameplay and combo/score elements of arcade games. There’s still some additional polish and tweaking needed in the coming weeks, and I’ll be interested to see just how much of a challenge the AI puts up on the harder difficulties. But I’m definitely impressed from these Early Access builds how much this small team has been able to put together, and think there’s real potential for Wrack to gain a decent fan base on Steam.